White vinegar is well-known for being a useful household cleanser and in recipes, but vinegar also contains nutrients, and has been used for treating ailments and skin conditions for centuries. 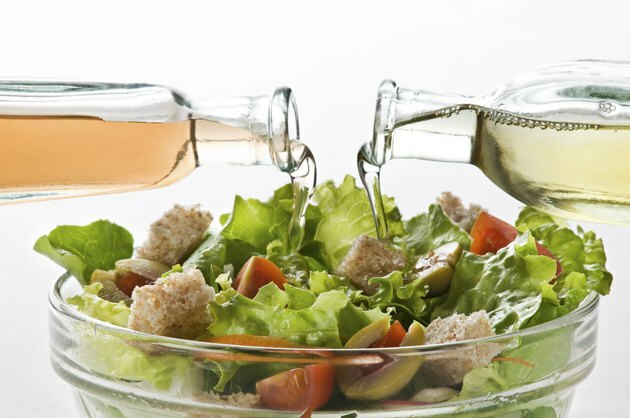 Vinegar is basically "sour wine"; cider vinegar is made from apples and has a mellow taste, while white vinegar, made from grain, posseses a harsher taste. Common white and cider vinegar have a 5 percent acidity, which is why they make effective cleansers and home remedies. Before using vinegar as a supplement or to treat any health condition, consult your physician. All vinegars, including white vinegar, contain nutrients. The Vinegar Institute notes that most vinegars contain vitamins like B-1, riboflavin and mineral salts and have no fat. The amount of vitamins and minerals in vinegar is minimal. White vinegar contains less than 3 calories per 1 tbs. White vinegar may help relieve itching and pain. White vinegar poured directly on bee stings or jellyfish stings can soothe the itching and burning. A few spoonfuls of white vinegar added to bath water helps relieve dry, itchy skin. White vinegar can be put on a washcloth and gently applied to sunburn to relieve pain. Always check with your doctor before using white vinegar on your skin. Bonnie McMillen, R.N., B.S.N., a nurse at the University of Pittsburgh at Bradford, notes that vinegar contains acetic acid and can be used to remove warts. The acid in the white vinegar works by slowly eating away at the wart. Over the counter remedies contain salicylic acid, which is stronger than the acetic acid in vinegar, but both are effective. A 2005 study done in Japan showed that vinegar reduced cholesterol levels in rats. Another Japanese study done in 2006 showed that drinking 15 ml of vinegar or eating "vinegared" foods suppressed blood glucose levels, according to The Vinegar Institute. White vinegar is used in pickling and as a tart addition to recipes like marinades and salad dressings. While there is generally no reason to abstain from using white vinegar, check with your doctor before taking any supplements.